Satellite images show the track of the fire as spreading naturally, with persistent winds blowing from the south-east. Its currently high up in the mountains, and there is no evidence of secondary fires. Edit: The R44 which is the only access road is closed, and there are firefighters everywhere, so this is implausible. Volunteers now get R250 per day ..surely not? January, Febuary, March, April, Ma.. oh never mind, got him. OMF cant believe its reached the Gordons Bay Mountains! Edit: That photo was taken on the evening of Mon 7th. Latest image (Wed 9th) shows 20km north-south fire scar, and over 100km^2 (10,000 hectares) burned!? As far as I can tell, the fire started due to some form of ignition in combination with the right amounts of oxygen and combustible material. Where do I claim my reward...? This was 2017. Fire hasn't reached that side of the mountain. Keep up the interesting posts Gordon! My old man has been in Rooi Els daily keeping up to date, it's such a shame this was caused by some idiot. The wind today (and tomorrow) is fresh to strong north-westerly, so the flare-ups are likely to push the fire back into unburned areas of Kogelberg. Heavy rain is expected from late afternoon into evening on Fri 11th. The New Year fire in the Overberg burnt a fynbos area that needed a good burn, but also burnt areas that have burnt too often, and haven’t yet recovered from recent fires. That is where the real ecological damage will happen. Our family home sits on 12 hectares of fynbos neighbouring the Kogelberg Biosphere Reserve between Pringle Bay and Rooi Els, and is one of the original portions of the farm, Hangklip. My parents bought it nearly 60 years ago, and we have survived many fires. Part of that survival is because we keep the property clear of alien vegetation, remove dead and encroaching bush, maintain a clean perimeter of buffalo grass (big enough to land a helicopter) and vetplantjies, and have planted fire-resistant indigenous trees for shade. Late into the night, we watched the glow intensify behind us. By midnight, it was looking very scary, and at 1am on January 3, I woke the household, and we evacuated to the main road. Update 10/1/19 09h00. IC reports that fire is largely contained (95%) with only active fire in Steenbras River area & descending to R44. Teams are anticipating, and are ready for, flare-ups that will require significant effort & still pose risk for spread. There are several fires raging in the Overberg and several areas are being evacuated. 1. Franskraal is being evacuated - residents can go to the Gansbaai Tourism Office, Uilenskraalnes and Uilenskraalvlei and Pearly Beach Club. 2. Betty's Bay is also being evacuated. More information to follow. 3. Several farms in Hemel-en-Aarde Valley is being evacuated including Bonna Dea. Motorists are asked to avoid the R320. 4. There is also a fire in the Haston area. Message from SAPS. ALL people in Bettys Bay must evacuate immediately as follows. From Harold Porter towards Kleinmond, Go to Kleinmond Town Hall. Everyone from Harold Porter towards PB, go to Pringle Bay Community Hall. My son is at Generations and they have been sent home. Hermanus CPF Overstrand FIRE Notification 11/01/19 at 15h30 : there are currently 3 run away fires burning in the Overstrand. 1. Betty’s Bay 2. Gansbaai 3. Karwyderskraal. Update on Betty Bay - sections are being evacuated 2. Gansbaai - Franskraal is in the process of evacuation. 3. Karwyderskraal - the Fire has jumped Hemel n Aarde Road, Camphill Road and Rotary Drive and is burning in Fernkloof Nature Reserve. There are evacuation orders in place. The following halls are available for use by those who have been evacuated: Grobbersaal, Gansbaai Tourism Hall, Sandbaai Hall and Crassula Hall, Betty’s Bay. Road closed : there is no access between Franskraal and Gansbaai, the R43 is closed at the entrance to Franskraal. The R320 Hemel n Aarde is closed and so is Karwyderskraal. Mountain Drive and Manolia Rd behind the High School is closed.R44 is closed from Kleinmond to Gordon’s Bay. R326 at Stanford is open to exit and enter the area. We appeal to people to stay at home unless. It is necessary to be in the roads. Please follow direction from officials. Edit: The wind is expected to abate soon after the front, and will change direction from NW to SW by sunset, which should eliminate some of the risk factors. Not saying there isn't, but this happens every single year - year after year and for decades. It's expected. The Overstrand Municipality is currently under threat from numerous wildfires spreading across the region. Mandatory evacuation messages have been ordered by the Fire and Disaster Management for a number of areas. In the Franskraal area, the fire is currently out of control and fire management has ordered an evacuation of all residents. There are currently two helicopters collecting ocean water and using it to bomb the fires in gale force winds. There are 94km\h wind gusts and wind speeds of 60km\h in Franskraal. The entrance to Franskraal on the R43 has been closed, which means there is currently no access between Gaansbaai and Franskraal. In the Hemel-en-Aarde Valley, well-known wedding venue Bone Dea and Camphill farm community and school, have been evacuated. The R320, the road that leads through the valley, has been closed. The residents of Hemel en Aarde Estate have been asked to remain on stand by until further notice. Farms in the Hemel en Aarde valley have already been ordered to evacuate. The Hemel en Aarde road, the R320, is currently closed. In Hermanus town, the fire is now coming down the mountain towards the back of cemetery, the High School, Hermanus Heights, Fernkloof and Eastcliff. Some residents have already been asked to evacuate. The Hermanus area is currently experiencing 63km/h wind speeds with gusts reaching up to 100-115km\h. 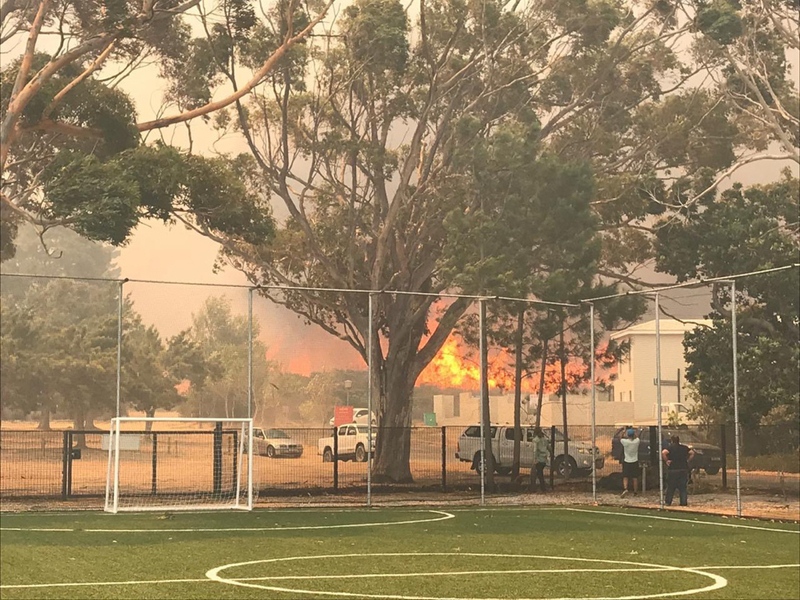 The fire in the Hermanus area has now moved behind the soccer astro turf at Generations schools Hermanus. The fire has spread over into the Fernkloof nature reserve, with evacuation orders in place. The two roads behind Hermanus High school, Mountain Drive and Manolia Road have both been closed as a result of the fire. 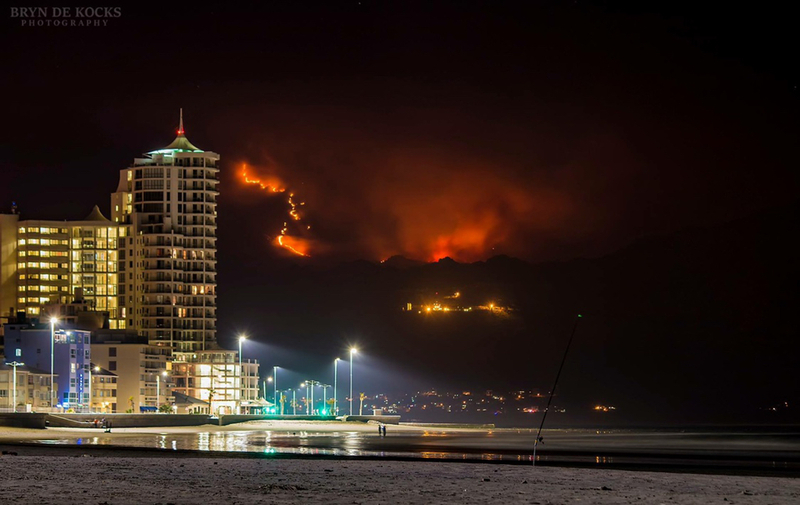 The Village NEWS is getting reports that the fire has flared up again in Betty’s Bay. Eye witness accounts have said that the fire has spread from Harold Porter National Botanical Garden towards Sunny Seas. The R44 between Kleinmond and Gordon’s bay has been closed. The R326 is currently free flowing from both directions however the Hermanus CPF urges everyone to remain at home unless instructed to evacuate. The wind speed in Betty’s Bay is currently at 63km/h and wind gusts are at 110km/h. EWN spoke with Overberg fire chief Reinhardt Geldenhuys who says Betty’s Bay is under threat.